DDC has done the superlatives before. It's memories of Matt Frattin steamrolling Kevin Wehrs. 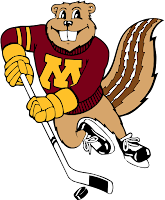 It's Blake Wheeler with an improbable diving goal for a Final Five Gophers victory. It's Chris Porter potting an overtime winner one week later to send the Fighting Sioux to the Frozen Four. It's Robbie Bina's 180-foot bouncing puck for a goal in Mariucci. It's 0.6. It's in-game and postgame scrums. It's intensity. It's passion. It's the best college hockey has to give. It's UND vs. Minnesota and simply put, it's The Rivalry. No. 4 North Dakota and No. 7 Minnesota faceoff this weekend and for the first time since 2013, the Gophers travel up to Grand Forks to take on UND. Frankly, there's really not much else that needs to be said about it as all who read this know what this series is all about. Strap it on, boys and girls. This one will be fun. Here's what to watch for in DDC's weekly "Who? What? How?" series preview. Jr. F, Tommy Novak, 1 goal, 3 assists -- 4 points; So. F, Rem Pitlick, 1g, 3a -- 4 pts; Fr. F, Brannon McManus, 3g, 0a -- 3 pts; Fr. F, Casey Mittelstadt, 2g, 1a -- 3 pts; Jr. F, Tyler Sheehy and Fr. F. Scott Reedy both likely out this weekend due to injury; Jr. G, Eric Shierhorn, 2-2-0, 2.50 goals against average, .918 save percentage. Jr. F, Rhett Gardner, 1g, 2a -- 3 pts; Jr. D, Christian Wolanin, 1g, 2a -- 3 pts; Jr. F, Joel Janautinen, 0g, 3a -- 3 pts; Jr. F, Shane Gersich, 1g, 1a -- 2 pts; Fr. F, Collin Adams, 2g, 0a -- 2 pts; Fr. F, Grant Mismash, 1g, 1a -- 2 pts; Sr. G, Cam Johnson, 3-0-1, 1.23 GAA, .938 SV PCT. The Gophers are averaging 19 penalty minutes per game, tied for 4th-most nationally. Minnesota is tied for 13th in the nation in team scoring with a 3.00 goals per game average. The Gophers have allowed six power play goals in 18 chances this season. The 66.7% penalty kill is tied for 50th out of 54 teams. UND is tied for 4th in team defense, nationally allowing just 1.25 goals per game and are 7th in Penalty Kill at 93.8%. Senior netminder Cam Johnson is tied for 8th nationally with a 1.23 goals against average. The Fighting Hawks are allowing just 20.25 shots on goals per game, the best mark in the NCAA. No. 7 Minnesota (2-2-0; 1-1-0 BTHC) split at home against Penn State last weekend, losing 3-1 on Friday and winning 6-3 on Sunday. Freshman Brannon McManus notched his first three career goals for his first collegiate hat trick in Sunday's win. No. 4 UND (3-0-1) swept St. Lawrence last weekend at home, 2-1 and 6-1. The Green and White had six different scorers in Saturday night's win. Senior goalie Cam Johnson and Freshman forward Grant Mismash were tabbed as NCHC goaltender and rookie of the week with their performances against St. Lawrence. Ranked 4th and 7th respectively, this will be UND and Minnesota's first meeting since January 18-19, 2013 in which the two teams faceoff as Top 10 teams in the polls. That was the last time the Gophers took on UND in Grand Forks. DDC has so many memories of this beloved and historic rivalry. It started in his youth with players like Jay and Jeff Panzer rolling over Minnesota in the old REA. Through high school, DDC watched players like Grant Potulny, Thomas Vanek and Phil Kessel rip his heart out with crushing losses. Moving into college, DDC experienced blowout wins behind the vaunted DOT and Pony Express lines and pure jubilation on the backs of Fighting Sioux sweeps in Mariucci and Chris Porter's OT winner in the 2007 West Regional final with a dozen of his closest friends. Post college, the historic tilts continued. The Timeout game in the WCHA Final Five semis. The Gopher win a week later at the X to send Minny to the Frozen Four. Then, of course, 0.6. Year after year, game after game, this Rivalry has brought out the best in both teams and DDC ultimately expects this weekend to be no different. With this weekend continuing a 7-year run of these two teams facing off each year, will another name be added to UND vs. Minnesota legend? Paging Shane Gersich. Austin Poganski. Paging Casey Mittelstadt. Rem Pitlick. Rivalry legends Chris Porter, Matt Frattin, Justin Holl and Blake Wheeler are waiting to hear from you. Both teams have started fairly well, with each ranked in the Top 10 in the country. While trends of Minnesota starting cold in special teams play and UND lacking scoring punch from expected team leaders in Shane Gersich and Austin Poganski have arisen, throw that out the window. Big players play big in big games. DDC fully expects to get Minnesota's best this weekend and the Gophers know the Ralph Engelstad Arena will be bedlam, this weekend. With how early this season is, DDC could just as well play it safe and pick a split between two good teams in a huge rivalry, but that wouldn't be DDC's style, would it? This weekend, it comes down to not only who's on the ice, but who's in the stands. With junior captain Tyler Sheehy and dynamic freshman Scott Reedy out this weekend, UND has a bit of an advantage in depth. Couple that with about 12,000 rabid fans getting to watch The Rivalry at home for the first time since 2013, DDC sees the stands as a big difference maker. UND SWEEPS THE GOPHERS WITH A LITTLE BIT OF HOME COOKIN', 3-2, 4-3. It's gonna be fun. Check back next week to see how it all went down and as always, thanks for reading! Labels: Casey Mittelstadt, Chris Porter, college hockey, Friday Gameday, Matt Frattin, Minnesota, Shane Gersich, The Rivalry, UND men's hockey, Who? What? How? UND/Minnesota -- What's a Rivalry? Pardon DDC for being a little bit disconnected the past two weeks. With Baby DDC No. 2 growing and battling sleep regression and his favorite baseball team playing currently playing in the ALCS (thumbs down... if you don't know what this means, Google it) DDC has been a wee bit predisposed. In the midst of all of this, in case you didn't know, my guess is you did, but in case you don't, the Minnesota Gophers travel to Grand Forks to take on the University of North Dakota men's hockey team this Friday and Saturday for a renewal of pleasantries in what has apparently become a debatable topic -- Is UND vs. Minnesota still a rivalry? What's in a Sports Rivalry? According to the Wikipedia entry on "List of sports rivalries", a sports rivalry is defined as an "intense competition between athletic teams or athletes, but not directly related to the formal sport and the practice thereof. This pressure of competition is felt by players, coaches, and management, but is perhaps felt strongest by the fans." So, in summation in DDC's words, a sports rivalry isn't necessarily about the ins and outs of the history between two teams (of course this is a massive part of it), but more about the experience and how players, coaches, teams respond to how the FANS feel about the competition. With this considered, there are two obvious sides -- Side 1 says "since UND and Minnesota have stopped playing yearly, the game is big, but doesn't feel the same." Side 2 rebuts with "the rivalry is as strong as ever regardless of how often they play." DDC is strong on side 2 with the two previous match ups (2014 Frozen Four semifinals and last year's series in Minneapolis) between UND and Minnesota showing an incredible intensity on the ice and a tremendous community response. Two examples of this.... one important thing to note. Listen to the crowd. DDC understands the importance of the 2014 goal, but the ovations are incredible. This makes DDC a bit sick to his stomach to show this, but it helps prove his point. Just a note, DDC didn't watch it, he just listened. So, if we're using the most recent example, this sounds like tremendous community support, correct? Well, let's take a look at how the teams feel about this "rivalry". What do the Players and Coaches Think? Head coach Brad Berry before UND traveled to take on Minnesota last season -- "It's on our walls in our rink here. (The players) get it from there. To hit on that point, we had T.J. Oshie and Taylor Chorney come in and give their point of view on how special the weekend is. Not only for the players, but for alumni watching. Obviously we haven't played them in a few years, but the history and tradition resonates through this building and through our program." By the way, what does that say about this set of games that NHL players TRAVEL TO GRAND FORKS to talk about it on their day off? UND forward Shane Gersich about the games against Minnesota -- "Everyone knows what this rivalry is about. We know what's at stake without even talking about." Former Minnesota forward Jake Bischoff before last year's series -- "My dad used to love playing North Dakota. Watching as a kid, I remember it being super intense; all the players would be getting into it with each other, and all the games were really competitive. It was always fun as a fan. Now, getting to play it should be unbelievable." Former Minnesota forward Justin Kloos before last year's series -- "These are the ones you highlight. These are the ones you dream about." So, so far... fans? Check. Players, coaches and alumni? Check. In short, when considering the parameters of how the FANS feel and how the teams respond, DDC thinks it's clear as day that UND vs. Minnesota is still as big as it comes when talking about a sports rivalry, particularly in college hockey. Outside of these stated parameters, consider the tickets to the actual games. The UND athletic department announced ticket prices for this weekend's series at the Ralph Engelstad Arena back in August at $99, this highest single-game price in REA history. Did this cause fans pause to buy these tickets? Absolutely not. In fact, the tickets sold out instantly back in September. Even the NCAA has recognized this rivalry, recently naming UND vs. Minnesota its No. 2 best in college hockey in a Facebook video. While DDC disagrees with this being No. 2, it still helps cement the point. The rivalry, yes, it is a rivalry, is back and we're all ready to go. So, how about a few pump up memories? Let's go. Check back tomorrow for a series preview. Thanks for reading!